Hi everyone. Today I am excited to welcome you to my stop on the Keeper of the Lost Souls blog tour hosted by YA Bound Book Tours. 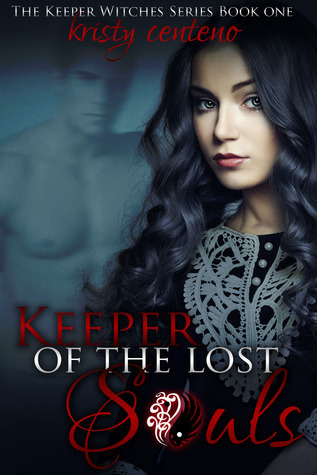 While you're here don't forget to enter to win a copy of The Keeper of the Lost Souls by Kristy Centeno and check out some of the other great blogger on the tour. Click HERE to see the full blog tour schedule! Like her mother and grandmother, Bryn comes from a breed of witches called The Keepers of the Lost Souls. Their main purpose is to guard those spirits who are permanently or temporarily grounded in the world of the living. Handling supernatural creatures is something which comes naturally to Bryn, however, dealing with people is a whole different story. As her 18th birthday approaches it's time for her to take on her first assignment. Bryn is forced to confront her inability to communicate with others in an effort to save the one soul that can mean the difference between life and death for mankind. A vendetta he has carried on even after death. As much as he hate's them he must join forces with a keeper witch, in order to stop a century old threat. When fate brings them together, not only will they be forced to learn how to work as a team, but they will have to depend on each other to stop an evil witch carrying a six hundred year grudge! THE SETTING AND SUMMARY: Bryn McCaskey has just graduated from High School and is about to celebrate her 18th birthday. She has hopes of enjoying a long summer before heading off to college and joining a very unique family business. You see, Bryn comes from a special breed of witches, and like her mother and grandmother before, she will become “The Keeper of the Lost Souls” on her eighteenth birthday. Her job will be to help lost souls to cross over and to guard them from danger, especially power hungry demons. But when Bryn is assigned 23 souls to guard, she never expected to meet someone like Johnny Shaw, who just happens to be from a secret bloodline, and number 23, her last and most difficult soul to work with. Young,handsome, and with a personal vendetta against witches. Not only does Bryn and Johnny have to learn to work together, but they also must join forces to stop an evil witch, and protect a powerful secret. MY FIRST THOUGHTS: As soon as I started reading Keeper of the Lost Souls I thought the “voice” of Bryn was great, and I cracked up when she had to deal with Marianne,who just happens to be her ex-teen bully from her high school and a ghost. I also couldn’t wait to see how she was going to deal with the twenty-three souls, especially one named Johnny Shaw, who has some secret family connections himself. CHARACTERS: I really liked Bryn’s character and felt for her as she struggled to balance a normal social life and school with her power as a witch and the supernatural world. She’s somewhat of an outsider (it doesn’t help that she talks to ghosts) and not too good at dealing with people. I liked how she tried to help others even when they weren’t the kindest to her. Johnny Shaw is really a bit difficult at first. He’s angry and frustrated that he is the last member of the Shaw family line, and is determined to protect a deadly secret, and it doesn’t matter whether he is alive or dead. I thought the banter between Johnny and Bryn was also great, and sympathized with him as he tried to overcome his distrust of Bryn. As secondary characters goes, I have to admit that I actually had a soft spot for Marianne even though she was such a pesky ghost, and often annoying, she was an endearing one to me. It was also nice to see the family involvement of her mom and grandmother in Bryn's life. I especially got a kick out of her feisty grandma. RECOMMENDATION: I thought The Keeper of the Lost Souls was a great read and would recommend it to those who are looking for a YA book that has a touch of magic, mystery and romance in it. My Rating: 4 Stars. I really liked it! Please Note: I received a copy of the book from the author for a full and honest review! As a child, I used to lose myself in an imaginary world by the means of a good book. Now that I’m all grown up, I get to create my own fictional realms and make them come to life in ways that most readers might not expect. I’ve always had a passion for writing but never had the opportunity do so until now. After trying out numerous options I realized that writing was what I loved the most so when I found myself with some free time on my hands, I decided to give it a shot. As it turned out, my very active imagination helped me achieve my goals of creating believable plots with some ordinary, and some not so ordinary characters that helped the stories move along in one way or another. As I keep moving along in achieving my dreams of becoming a published author, I divide my time in between my four children and my very understanding husband. 3 e-books of Keeper of the Lost Souls, Open Internationally!